A man drives a horse-cart past the wreckage of a truck torched during recent demonstrations along the road in Holonkomi town, in Oromiya region of Ethiopia, Dec. 17, 2015. The United States says it is "deeply concerned" about the recent clashes in Ethiopia's Oromia region that have resulted in the deaths of numerous protesters who are angry about plans to turn farmland into developed land for business. The State Department released an announcement by deputy spokesman Mark Toner early Saturday saying the U.S. urges the government of Ethiopia to permit peaceful protests and commit to a constructive dialogue to address legitimate grievances. It also urged protesters to refrain from violence and be open to dialogue. Rights group Human Rights Watch said Saturday that it has evidence of some 75 protester deaths in recent weeks in situations where government security forces fired on them. It said many more protesters were wounded in those clashes. HRW warned in a statement that the government's response to the protests has resulted in "a rapidly rising risk of greater bloodshed." The protesters have been demonstrating for nearly a month over plans by the government to develop farmland outside the capital, Addis Ababa, into a new business zone. The deaths are attributed to clashes with security forces. On Monday, Ethiopia's government said five people had been killed in the protests and cautioned that the death toll could rise. Opposition supporters say the number of deaths is significantly higher, putting their estimate at 30. The protesters, who are from the Oromo ethnic group, say the government plan will lead to a loss of autonomy and marginalization for Oromo people living on the outskirts of the capital. Opposition groups say the protesters are mostly students and farmers, while the government describes them as "extremist Oromo groups" and "armed gangs." 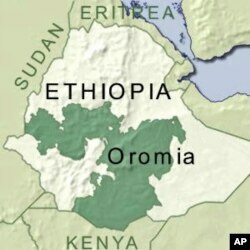 Oromos are Ethiopia's largest ethnic group, comprising about 40 percent of the country's population.